Simple to operate and versatile in its applications, an oscillating "multi-tool" is a must-have handheld device for DIYers and professionals. It works with a side-to-side movement that can be used to cut, grind, scrape, or grout. A well-built oscillating tool should be able to handle both small and large projects, and can deftly handle corners and narrow spaces. The small front-end profile and blade can extend into tight spaces without damaging the surrounding structure or material and can produce professional results. Whether the oscillating tool needs to get into cramped corners or take on a bigger project like cutting rot out of wood flooring, we found the top-rated oscillating tools to make any job easier. This is one of the more capable and well-stocked oscillating tool kits that continually top reviewers’ lists. 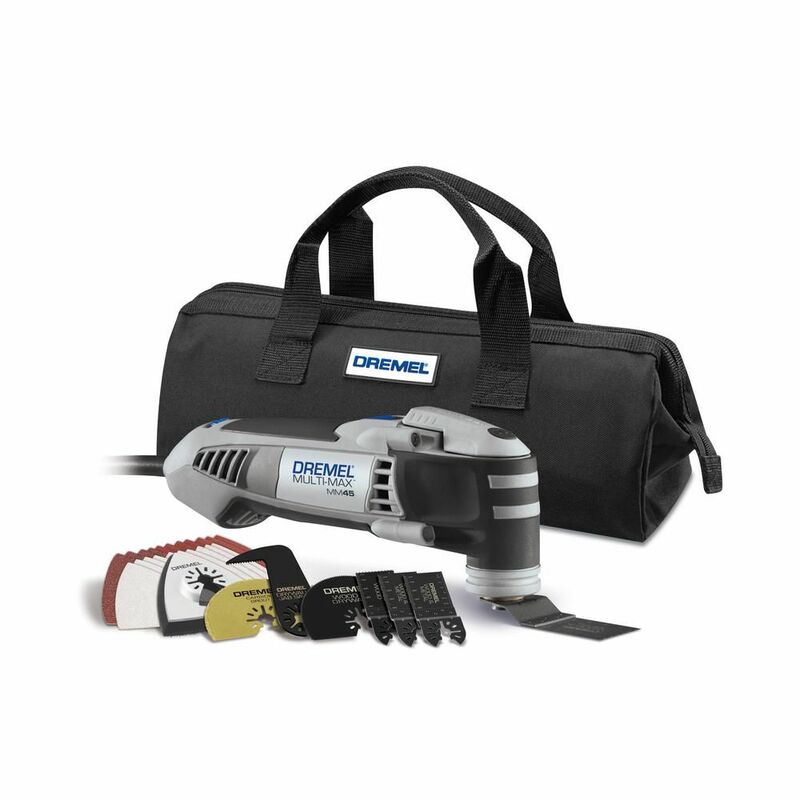 Dremel has packed a bag full of all the accessories you need for sanding, cutting wood and drywall, snapping off metal nuts and bolts and getting rid of grout in a hurry. It comes with a powerful 5-amp variable speed oscillating tool with a speed range of 10,000-21,000 OPMs. AT just under 3 pounds, the lightweight tool can consistently cut and sand through thick and thin materials with little vibration or kickback. Dremel crammed the bag with 21 sanding sheets, five blades, a hook and loop pad among other needed accessories for a tidy kit that is good to have close at hand. The included accessories snap off and on with little resistance with Dremel’s standard Quick Hold magnetic flange that keeps them in place during operation and allows for easier tightening. The sleek storage bag is packed with 28 accessories to tackle most any issue that pops up on a job. Reviewers found it quieter than other oscillating tools of its same speed capacity and consistent in its performance job after job. Light in weight and on the wallet, the Genesis multi-purpose oscillating tool doesn’t disappoint in its value and power. Reviewers found the price tag to be perfect paired with the versatility of the compact corded machine. It worked well in corners and close quarters as a sander, saw, powerful scraper, and detailed grout remover. The 1.5-amp motor is smooth and consistent in its delivery. The narrow oscillating head gives 21,000 oscillations per minute with little vibration. A 4-pin flange firmly holds the included accessories in place. The Genesis comes with the 4-pound tool, 3-inch hook and loop sanding pad, extra sandpaper, rigid scraper blade, a 3-inch wood and drywall blade, Allen wrench, and a 30 mm flush cut blade. Reviewers found the flush cut blade to be versatile for narrow jobs around door jambs, windowsills, and trim. It’s powerful prepared to tackle nearly any job. The Makita 18-volt cordless oscillating multi-tool can take on tile, plaster, drywall, wood flooring, PVC and more. The variable-speed control revs up to a smooth 20,000 OPM. The tool can also run at a gentle 6,000 OPM when a soft touch is needed on woodwork, glass or other fragile material. The 18-volt LXT batter is sold separately and only takes 30 minutes to charge. The ergonomic grip paired with the 3.2 degree oscillation angle cuts down on arm fatigue and allows for serious cutting and sanding at a rapid pace. Makita has an easy-change design for switching quickly between accessories when completing complicated projects. The built-in LED light is a bonus and brighter than most cordless units, according to multiple users. This makes working in cramped, dark spaces or in and around inner doorways easier. The unit comes with adapters that can work with other brands of oscillating tools. The large on and off switch is easy to manipulate when wearing bulky gloves and. The lock-on button ensures that the tool doesn’t inadvertently switch off in the middle of a job. Rockwell has made one of the more powerful oscillating multi-tools on the market. The two angles, 5 and 3.4 degrees, paired with the 4.2-amp motor allow you to go from slow and steady to fast and furious. The Rockwell is dependable to quickly complete light and heavy-duty jobs, from cross-cutting, plunge cuts, trimming precise cuts or slicing swiftly through metal pipes or sheeting. It has a cutting load of 35 pounds, an industry maximum. Reviewers preferred the Rockwell for its ability to vacillate between aggressive and precise speeds and that it doesn’t stall when pushed to its maximum capabilities. It can deliver speeds from 10,000 to 19,000 OPMs without significant vibrations. It comes in at just over three pounds, making it easier on arm and back muscles when using the machine on long, difficult jobs. The brushless motor can go from o to 20,000 OPMs in under a minute. Weighing in at just over 3 pounds, the lightweight DeWalt multi tool has 20 volts rather than the typical 12 volts of most oscillators, which allows it to quickly slice through sheetrock, light woods, and metal. The quick-change lever allows for keyless blade changes for fast swapping between the 28 included accessories. The kit comes with 2 Ah and 4Ah rechargeable batteries for longer running time without having to switch out the power source. The cordless workhorse is quiet and powerful, effortlessly cutting through most materials quickly, according to most reviewers. It’s compact but hefty at 7 pounds. It comes with DeWalt’s 3-year limited manufacturer warranty. The 3.8-amp motor is powerful enough to quickly sand down rough patches for a smooth surface and gentle enough to add a shine to a mottled wood mantle. The on/off switch is conveniently placed for one-handed use to keep speed settings consistent as the tool grinds away at tough veneers or a thin sheen of stain. Dremel’s Multi-Max oscillating tool smoothly runs at 20,000 strokes per minute. The kit is filled with accessories perfect for sanding and finishing jobs, including 15 sheets of MM70W sandpaper for wood, 14 sheets of MM70P sandpaper for paint, a MM502 1/16-inch grout blade, MM610 flexible scraper for tougher jobs and four cutting blades. It’s a handy kit for paint jobs, with the drywall blades a bonus accessory for users who reached for the kit regularly on home improvement jobs. Dremel’s Quick Lock accessory change system is a key feature for reviewers who bought this kit. This kit is packed with the essential accessories for an oscillating tool and then some. It has 52 accessories to complete a multitude of projects. Porter Cable’s powerful 3-amp motor can cut through tough jobs quickly. The kit comes with a depth and cutting guide that offers more control for slicing into wood and plunge tasks. The 10-foot cord gives plenty of play for getting around big jobs. Porter Cables signature tool-free blade change system is a user favorite. It allows for quick changes to effortlessly switch from sanding to cutting or vice versa without using other tools to attach accessories or fumbling with bolts. This decreased the time spent on finishing projects. The oscillating tool is compatible with other accessories you may have on hand and can fit blades from most manufacturers easily, a major selling point with reviewers. 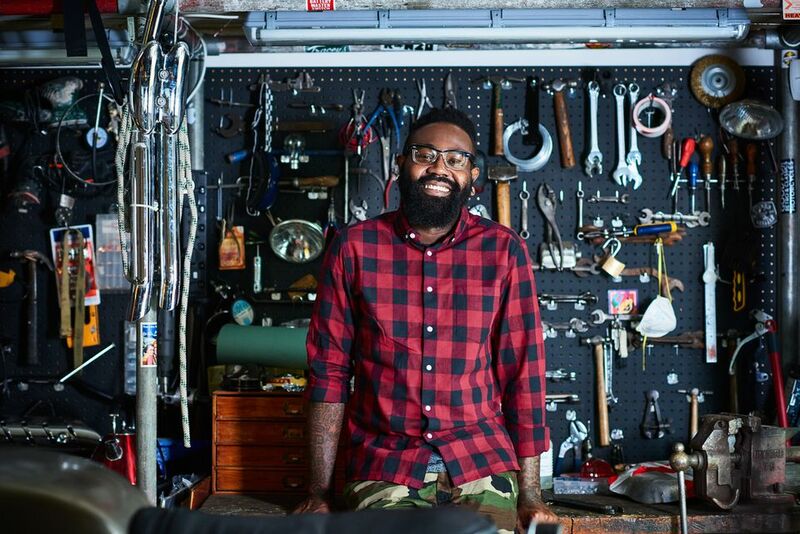 If a blade breaks or just doesn’t quite fit in the space that you need it to, having an extra set of hard-working accessories on hand is a bonus. The WorkPro 24-piece oscillating accessory kit gets high marks for its value and blade diversity. Each piece for cutting, scraping, shaping, sanding, polishing, sawing and grout removal is universal. They will click into place with all major brands and a few from overseas. The hard case kit includes a semi-circular saw blade for wood, drywall, and metal, a rigid and a flexible scraper blade, standard flush-cut saw blade, triangular carbide grout removal rasp and a semi-circle carbide blade among the many sanding pads for different materials. Reviewers raved about the durability of the universal blades that snapped into a variety of oscillating tools.